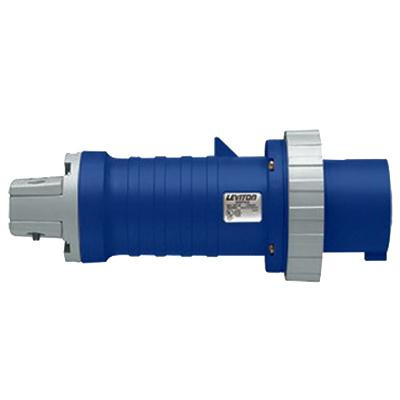 Leviton 4-Pole 5-Wire Industrial-grade water-tight pin & sleeve plug in blue color, withstands current rating of 100-Amps and voltage rating of 120/208-Volts. It withstands temperature rating of 30 deg C. This 3-Phase connector accommodates 0.95 - 1.875-Inch wire and has screw terminal connection. It has reinforced nylon contact for better conductivity. Connector has dielectric strength of 2000-Volts. Connector has brass construction provides reliable electrical contact, maximum conductivity and corrosion resistance. It has multiple contact points, which ensures continuously reliable electrical connection. Plug measures 12.3-Inch x 5-Inch. It has heavy-duty valox 357 exterior cord clamp that provides maximum corrosion protection. It has IP67-degree of protection. Connector is UL listed and CE/CSA certified.